She has trekked to Everest Base Camp, killed a guinea pig for food in Ecuador, and been spat on in the Amazon by a Shaman who was performing her exorcism. Tammy Lowe is the adventure traveler I aspire to be! I absolutely had to interview her! That I get to visit countries completely different to my own. I am kind of addicted to culture shock…the more the better in fact! I am from Germany, so walking down an immaculately clean and orderly street in Munich, and visiting a remote village in the Cambodian province couldn’t be any more different, but I love it. Discovering those differences is really what I love about travelling. So you’re addicted to culture shock, what is the biggest cultural shock you have experienced while travelling? That was probably during a home stay in rural Ecuador. 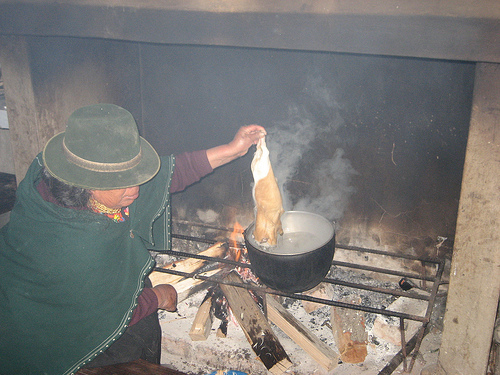 The family we stayed with lived in very simple accommodation and wanted to cook us a traditional and festive dinner. They asked us to join them for the preparations. Little did I know that that would include killing a guinea pig, dipping it into boiling water, plucking the fur off it, taking out the intestines, BBQ-ing it and then eating all parts…including the head. Certainly not what I was used to from living in sterile England or Germany, but it was kind of fascinating and opened my eyes to how the vast majority of the world actually live. And as I said before, I kind of like culture shocks during my travels, so it was a really eye-opening experience. As a child I never really went on holidays, especially not outside of Germany. My grandma was quite the adventurer though and when she retired she started traveling a lot. She always came back with such interesting stories and exotic presents, which really inspired me to do as much travelling as I could when I grew older. When I was 17 I went on my first holiday abroad without my parents. When I was 18 I did my first solo trip. By the time I was 19 I had even moved abroad, and I knew that this was only the beginning of my new found travel addiction. I really like discovering places that are off the beaten tourist path and that are adventurous. There is nothing wrong with traditional sights, such as the Eiffel Tower or Tower Bridge, but I like digging a bit deeper and visiting places where I can really immerse myself into local culture. 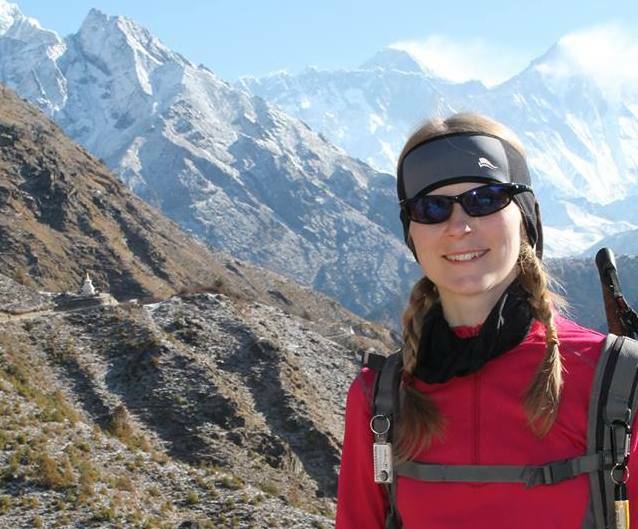 I am a bit of a repressed explorer, so things like trekking in the Himalayas or staying with families in the deepest Amazon, is something I much prefer over a beach break to be honest. Trekking deep in the Amazon. One thing which you don’t like about travelling? I don’t like travelling from a to b, as this usually involves long flights or uncomfortable bus journeys. I get bored incredibly easy and sitting still for a long time is just not for me. I don’t live an extravagant lifestyle. I rent a cheap apartment; don’t buy Starbucks coffees all the time and I haven’t been clothes shopping for over 6 months. This way I can save enough money to travel regularly. I have also been living in Cambodia for almost 2 years now, so being so close to so many awesome countries geographically really reduces my travel costs. A Scottish couple in their late 70ies who we met trekking to Everest Base Camp. Their fitness levels put me to shame – and I am 32! The man had only just given up running ultra-marathons (that is a 100 mile marathon!). He was absolutely crazy! They lead such a cool lifestyle too. They divided their year between living in Scotland, South Africa and travelling around the world. Really interesting and inspirational people. Before we went to Nepal for our Everest Base Camp trek we wanted to spend a couple of days in Delhi. Only problem was that we failed to obtain visas beforehand. Oooops! When the flight attendant at Bangkok airport told us that we can’t fly into Delhi without a visa I nearly cried. We had to stay in Bangkok instead and as we had already booked hotels in Delhi and had to reschedule our flights to Kathmandu is was a fairly costly mistake to make. I was taking part in a shaman ceremony in the Amazon. The shaman said that my body was possessed by some kind of evil spirit, so he wanted to do a cleansing ritual for me. He started chanting and singing, was dancing around me and brushing a branch of herbs on my shoulders and head. That was all kind of nice and I started to relax, until – HE SPAT IN MY FACE! He took a huge sip from a bottle of alcohol and spat it back into my face. I was so shocked that I didn’t know what to say or do. Apparently this was completely normal practice, but it was still gross none the less! Only when I looked at some photos afterwards did I notice that there was a weird black spot or shadow above my head. I still don’t have any idea what it was, but maybe it was the evil spirit he was referring to, so I have forgiven him for spitting in my face. Evil spirit above my head. I am addicted to taking photos and I take photos of everyone and everything during my travels, so my DSLR camera is coming with me wherever I go. I love trekking, whether that is mountain or jungle trekking, so I always take my boots with me, despite them being quite clunky. I am probably THE palest person in the world (I am up for a challenge though). I never tan and only turn bright red, so I have to take sun cream with me wherever I go; otherwise I end up looking like a raw chicken. All of these places are very remote and only accessible by foot and a few days of trekking. They are the kind of places where I could really fulfill my explorer fantasies. Most practical piece of travel advice? Try and mingle with locals to get a real good feel for local cultures. A homestay is a really good way to do just that. Who is better placed to tell you something about a country: Lonely Planet or a local? For me a local beats Lonely Planet every time. Traveling exposes people to other cultures, exotic foods, but also social evils. Seeing poverty first hand really opens your eyes to a lot of things and it will also probably make you question what could be done about it. Travel changes you and how you see the world. Tammy is one half of Tammy & Chris on the move. 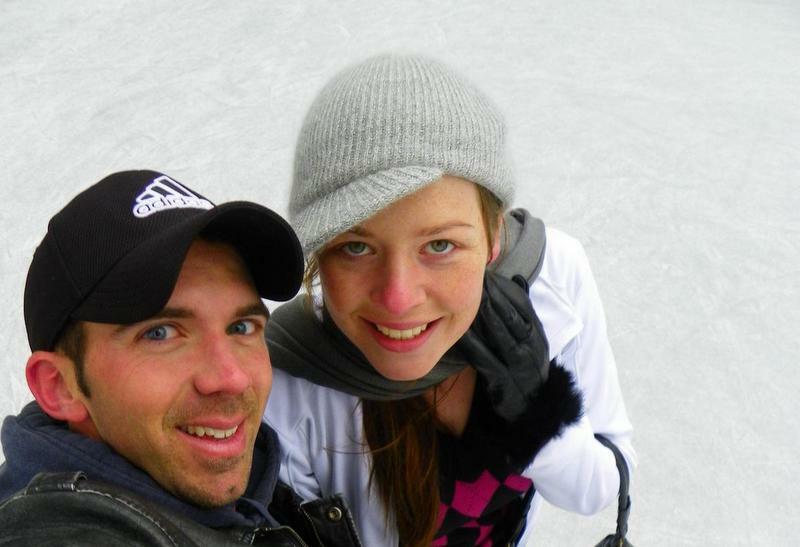 Tammy and Chris left their life in England in 2011 to work on justice and human rights issues in Cambodia. Their blog follows their adventures and misadventures traveling around South East Asia in their downtime. Follow them on Twitter, Instagram, Pinterest, or Facebook. Thanks again for taking part and providing a great interview! Great interview and love the photos! Killing a guinea pig would totally rate high in the culture-shock-o-meter. Yes, I imagine it would for me as well! I’ve never had to see my food killed beforehand! And I thought I was cool. Great interview and great post. Thanks for sharing. I agree with the mention of old people sometimes being the most adventurous around. Old people in hostels are usually a lot more adventurous than the 19 year old guys in the same place. Totally agree! And they normally have some of the best stories!! I love hearing stories from my grandparents about their previous travels – they have such fascinating tales to tell!! Hi Marcelle, thanks for sharing your experience – we’re not hugely big on the touristy spots either, and it’s quite sad when we’ve hyped up a destination in our mind to then find it’s overrun with ridiculous crowds (the Vatican was that for me).